Since ancient times, food processing has played an important role in delivering quality products to consumers. Techniques such as salt preservation, fermentation, and sun drying were used early on to remove harmful toxins and microorganisms from food, enhance its overall consistency, and enable its transportation over long distances. While some of those same techniques are still used today, the food industry has turned to more sophisticated approaches over time that foster greater efficiency and higher quality. 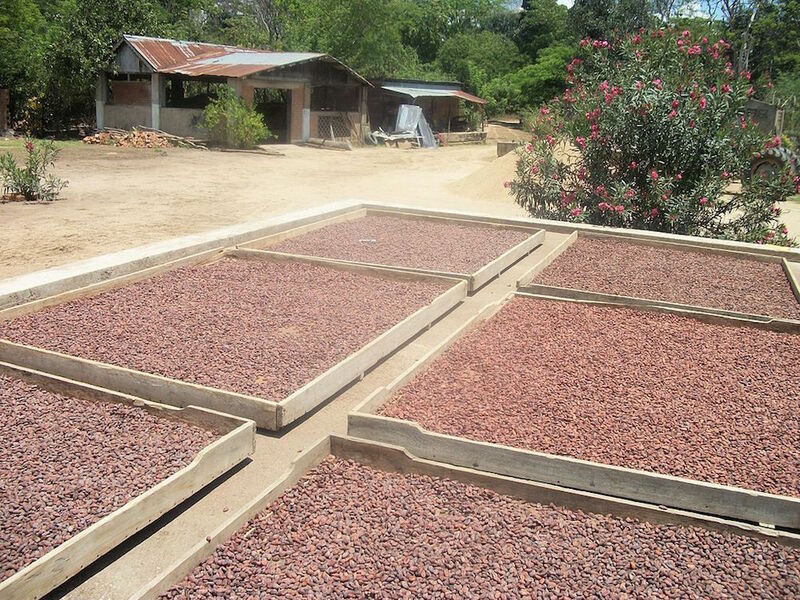 Sun drying is one type of food processing technique. Image by ArianeCCM — Own work. Licensed under CC BY-SA 3.0, via Wikimedia Commons. Induction heating, for instance, has become a favorable option for food processing. Compared to methods where pipes are heated by hot water or steam, induction heating enables better control of temperature, which, in turn, helps prevent local high temperatures. This better preserves the quality of the food, while optimizing the efficiency of food processes like pasteurization and sterilization. What’s more: Pipes can easily be swapped out to treat different types of food, as they don’t need to be in direct contact with the coil. And, as a further advantage, the process itself requires little to no water as it is based on electricity. When it comes to the reliability and efficiency of induction heating in food processing, the coil and pipe configurations have a significant effect. 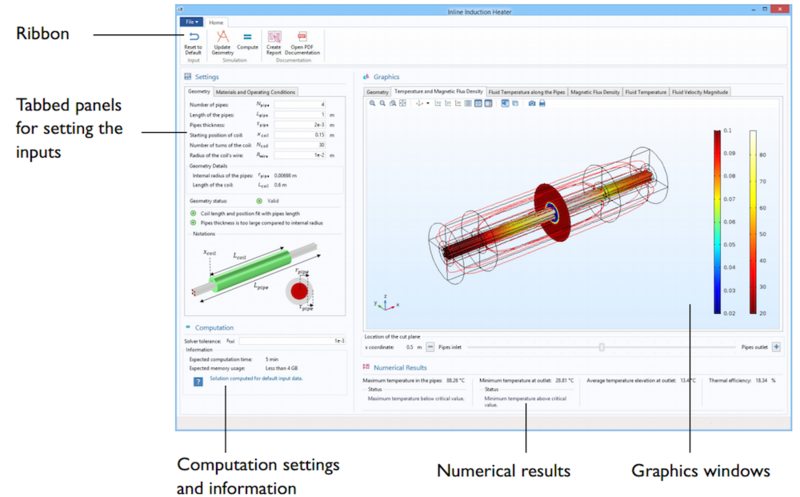 As we will highlight in the next section, numerical modeling apps serve as a useful tool for testing various design configurations, delivering fast and accurate results to its users. To begin, let’s take a look at the underlying model of our Inline Induction Heater app. The model consists of a circular electromagnetic coil that is wound around a set of pipes through which a fluid (liquid food) flows. As an alternating current passes through the coil, it generates an alternating magnetic field. This field then penetrates the pipes, producing eddy currents within the pipes and heating them up. Geometry of an inline induction heater model. The app itself is designed to measure the inline induction heater’s efficiency in heating the fluid as it flows through the pipes. It investigates the use of both nonferritic and ferritic stainless steel pipes. Due to its relatively low and stable price, a result of the absence of nickel in its components, ferritic stainless steel has grown in popularity in the food industry, offering new potential in food processing. Now that we’ve covered the foundations of the app, we can shift gears to its design. Keep in mind that when designing an app of your own, you have control over the parameters that are included and its particular layout and structure. The result: an easy-to-use tool that is tailored to your specific needs. The user interface (UI) of the Inline Induction Heater app. If these criteria are not met, the status will render as invalid until the necessary modifications are made to the geometry. This helps ensure that users generate realistic simulation results when running their tests. Tabs for the Settings section. The Materials and Operating Conditions section, meanwhile, features a series of input parameters that allow specification of the pipe material, operating conditions of the coil, flow conditions, and target temperatures. In the case of the pipe material, users have the ability to choose from two predefined options: Stainless Steel 410 (martensitic alloy) and Stainless Steel 410s (ferritic alloy). 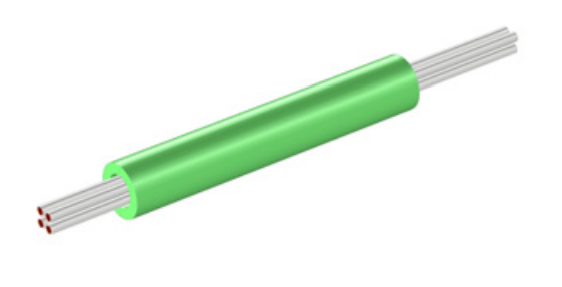 Fitting with the theme of customization, they can also choose the Stainless Steel (User defined) option in which it is possible to modify the electrical conductivity and relative permeability. After making their respective modifications to the parameters, users can then shift their focus to the Graphics section. Several graphical plots are shown here, including the geometry, temperature and magnetic flux density, fluid temperature along the pipes, magnetic flux density, fluid temperature, and fluid velocity magnitude. Modifying the geometry and materials and conditions of the inline induction heater, with numerical results shown. Note that no sounds are included with this recording. 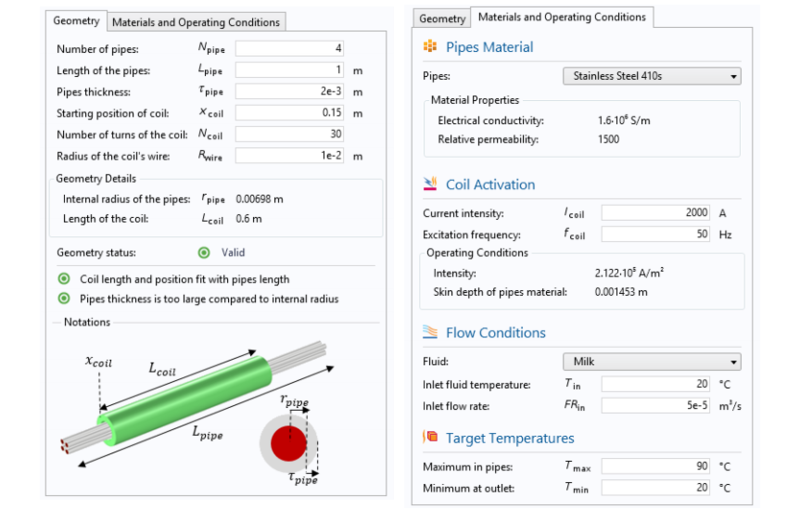 The Numerical Results section displays the maximum temperature in the pipes and the minimum temperature at the outlet. If either of these values are above or below the critical value, users will be notified via a message under the Status sections. The average temperature elevation at the outlet and the thermal efficiency of the inline induction heater are also included under Numerical Results. Once the users have obtained their results, they can generate a report by simply clicking the Create Report button in the ribbon. Doing so provides them with an easy way to share and communicate their findings with other people involved in the design workflow. Apps are powerful tools that hide complex physics beneath an easy-to-use interface. By empowering more people to run their own simulation tests, these tools facilitate greater efficiency in design workflows, while ensuring accuracy in the results that are obtained. Here, we have demonstrated how this approach can benefit the design of an inline induction heater for food processing, allowing users to easily test out different configurations until achieving the desired results. As this example illustrates, apps serve as a viable resource for helping the food industry accelerate the optimization of food processing techniques, pairing quality with efficiency. Like the other demo apps featured in our Application Gallery, the Inline Induction Heater app is designed to serve as a source of inspiration and guidance in your own app-building processes. 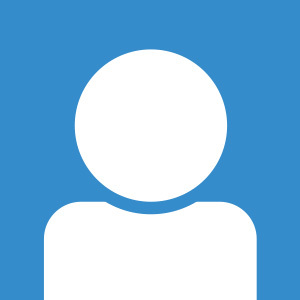 We encourage you to use it as a foundation for creating apps of your own, giving users the ability to change these same parameters or alternate ones that fit your modeling needs.